The American Revolution (June 18, 2012) | Written by Natalia Viana of Pública | Republished in English on the website In Serbia by Vladimir Stoiljkovic on Nov 24, 2013. “It’s called a soft coup”, he said. “It was ten years of student organization in the 90s”, says Ivan Marovic, one of the college boys who protested against Milosevic, but who has no connections with the Canvas group. “In the end, overseas support finally came. I would be silly to deny it. They had a major role at the final steps. Yes, US came with money, but it also came from the entire world: Germany, France, Spain, and Italy. Everybody was collaborating because none would support Milosevic anymore”, he said at an interview with Pública. “Depending on the country, they donated in a different way. North-Americans have strong “arms” formed by NGOs, very active in the support of certain groups, and other countries like Spain don’t, and support came via Foreign Ministry”. Among the NGOs are the National Endowment for Democracy (NED – an organization financed by the U.S. Congress), Freedom House and the International Republican Institute (IRI – linked to the Republican Party), as Marovic states. Both of them receive large amounts of money from USAID (United States Agency for International Development), who was ahead of the coups in South American in the 60s and 70s, including Brazil, writes Pública. All those NGOs are well known by the Latin-American countries, including the new ones. IRI, for instance, gave “political training courses” for 600 haitian opposition leaders in Dominican Republic, between 2002 and 2003. The coup against Jean-Baptiste Aristide, the legit president elected democratically, occurred in 2004. In an investigation by the U.S. Congress, the IRI was charged for being behind the scenes of two organizations that conspired to dethrone Aristide. In Venezuela, NED sent US$ 877 thousand for opposition groups, months before the failed coup in 2002, as reported by the NYT. In Bolivia, according to US government documents obtained by journalist Jeremy Bigwood – a partner of Pública -, the USAID ran the Office of “Transitions Initiative”, which invested US$ 97 million in “decentralization” and “regional autonomy” projects since 2002, strengthening the provinces that opposed Evo Morales. In contact with Pública, Srdja Popovic, Canvas leader, said that the organization doesn’t receive any funding of any governments, and that its major funder is the Serbian businessman Slobodan Djinovic, who was also a student leader in the past. However, a presentation of the organization, leaked by Wikileaks, points out partners of Canvas such as IRI and Freedom House, which receive large sums of USAID. For researcher Mark Weisbrot of the Center for Economic and Policy Research from Washington, organizations as IRI and Freedom House “are not promoting democracy”. As seen on the same presentation, Canvas’ work really impresses. Between 2002 and 2009, it realized 106 workshops, reaching 1.800 participants from 59 countries. Not all of them are North-America’s objectors – the group has trained activists in Spain, Morocco and Azerbaijan – but the list includes many of them: Cuba, Venezuela, Bolivia, Zimbabwe, Belarus, North Korea, Syria and Iran. According to Canvas, the situation was important in all of the so-called “colored revolutions” that spread in former USSR countries, in the 2000s. The document points as “well-succeeded cases” the transfers of knowledge to Kmara movement, back in 2003 in Georgia. That group launched the Roses Revolution which overthrew the president; a little help in the Orange Revolution, in 2004, in Ukraine; by training groups that ran the Cedar Revolution in 2005 at Lebanon; several projects with NGOs in Zimbabwe and the opposition coalition for Robert Mugabe; activists training in Vietnam, Tibet and Burma, besides the “post-democracy groups” projects in Syria and Iraq. In Bolivia, they assisted the Santa Cruz groups, which are the most staunch opposition groups of Evo Morales, in the preparation for the 2009 elections in that country. Until 2009, the group’s main manual, “Non Violent Struggle – 50 Crucial Points” had already been translated to five languages, including Arab and Farsi. One of Canvas actions that had earned notorious visibility was the training of a leadership for the April 6 movement, considered to be the spark for the Egyptian Spring. This movement started its organization via Facebook in solidarity to the textile workers at the city of Mahalla al Kubra, in the Nile Delta. It was the first time the social network was used in this purpose in Egypt. In the mid-2009, Mohammed Adel, one of the April 6 movement leaders, traveled to Belgrade to meet Popovic. In the Stratfor analysts’ mailings, Popovic boasts himself in maintaining relations with April 6 movement leaders, in special to Mohammed Adel – which became the main source of information about the Egyptian uprising in 2011. In Stratfor inside communication, he is known by codename RS501. “We just talked with our friends in Egypt and found out a few things”, he states on January 27, 2011. “Tomorrow the Muslim Brotherhood will bring their strength to the streets, so it can be even more dramatic… We have obtained better information of these groups and how they organize in the last few days, but we are still trying to know them”. The leaked documents show Canvas acting less independently than it really states. At least in two occasions, Srdja Popovic had participated in National Security Council (NSC) meetings. The first mentioned meeting occurred in December 18, 2009, and the topic under discussion was Russia and Georgia. At the time Popovic’s “best friend” worked at the NSC, in his own words the “senior counselor to Russia for Obama”, Michael McFaul, who is nowadays ambassador for that country. This same meeting was all about funding opposition in Iran via pro-democratic groups, as Popovic later said, a topic of special interest for him. “The Iran policy is made by Dennis Ross, in NSC. There is a crescent function on Iran at the State Department under the Assistant Secretary John Limbert. The Pro-Democratic Program funds for Iran rose from US$ 1.5 million in 2004 up to US$ 60 million in 2008 (…) After June 12, 2009, NSC decided to neutralize the existing programs’ effects, which started in Bush administration. Apparently, the bottom line was that U.S. doesn’t want to be related to interferences in Iran’s internal politics. The U.S. won’t give to the Iranian regime an excuse for rejecting the nuclear program negotiations”, said Serb, which believes that the Obama administration would be acting like “an elephant in a dishes store” with its new policy. “As a result, Iran Human Rights Documentation Center, Freedom House, IFES and IRI had their appeal requirements rejected”, he says in an email at beginning of January of 2010. The second Popovic meeting at NSC had occurred at 5 p.m. on July 27, 2011, as Popovic related to analyst Reva Bhalla. “These guys are awesome” said in an enthusiastic email, the Stratfor analyst for Eastern Europe, Marko Papic. “They open a small shop in a country and then try to overthrow the government. If well used, they are more powerful than an air force combat battalion”. In his own words, Marko explains to his colleagues at Stratfor that Canvas is an “export-a-revolution” group – “It still depends on US funding, and basically travels around the world in search of autocratic and dictatorial governments to overthrow (the ones US don’t like)”. In the mailing, Popovic demonstrates great interest in exchanging information with Stratfor, whom he calls as “Austin’s CIA”. In order to that, he manages to contact many activists in different countries. Besides maintaining a relation with an organization with the same ideological vein, he establishes a valuable information exchange, Pública wrote. For instance, on May 2008, Marko said to him that he acknowledged that Chinese Intel would be considering striking the organization for their work with Tibetan activists. “That was already expected”, answers Srdja. On May 23, 2011, he asked for information about regional autonomy for the Kurds in Iraq. One of the most frequently themes in discussions with Stratfor’s analysts is Venezuela. Srdja helps analysts to understand what the opposition is thinking. All the communication is made via a safe and encrypted email, as Marko Papic states. Moreover, the Canvas leader went to Stratfor’s headquarters in Austin, in 2010, to make a briefing on the situation in Venezuela. “This year, we are definitely going to increase our activities in Venezuela”, explains the Serbian in his “Venezuela Situation Analysis” presentation, on January 12, 2010. For that year’s election on September, he states that “we are in touch with activists and people that may help you”, and prohibits the publishing or spread of that information by the analysts. 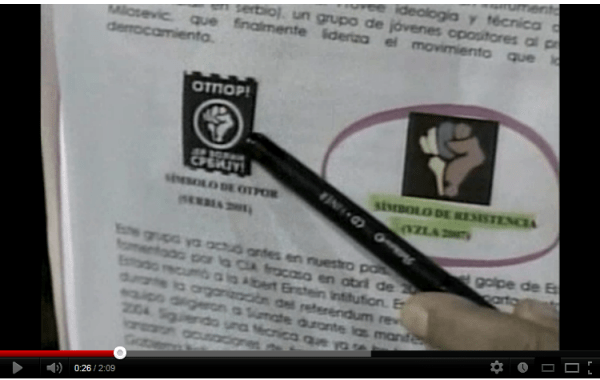 The document sent by email, would be the “basis of our analysis of what we plan to do in Venezuela”. On the next day, he reiterates in another email: “Explaining the action plan we sent yesterday, it is obviously a revolution guide”. The document Pública had access, was written at the beginning of 2010 by the “analytical department” of the organization, and reports not only the pillars for the Venezuelan president, but also lists the main institutions and organizations that support that government (among them are the Armed Forces, the Police, the Justice, nationalized sectors of economy, Teachers and the Electoral Council), the major potential leaders in order to form an efficient coalition and its “potential allies” (students, the independent and the international press, syndicates, the Venezuelan Federation of Teachers, Rotary Club and the Catholic church). At the end, Canvas’ indications seem quite right. Among the major opposition leaders that would have the capability of unifying them, are Henrique Capriles Radonski – governor of Miranda state and an opposition candidate in elections on October by the ‘Mesa de Unidade Democrática’ coalition -, the mayor for the Metropolitan District of Caracas, Antonio Ledezma, and the former mayor of the City of Chacao, Leopoldo Lopez Mendoza. Also listed are two student leaders, Alexandra Belandria of Cambio group, and Yon Goicochea of the Venezuelan Student Movement. The strategy’s main goal is “to provide a basis for a more detailed planning and to be potentially executed by interested parties and by Canvas”. This “detailed” plan would be developed afterwards with interested parties. In another email, Popovic explains: “When somebody asks for our help, like it is in Venezuela, we formally make the question: ‘how would you do that?’ (…) In this case we have three campaigns: the unification of opposition, the campaign for the September election (…) In NORMAL circumstances, activists come and join us to work together in a workshop format. We simply guide them, and that gives efficiency to the plan because the activists create it themselves, it is fully theirs, in other words, it’s authentic. We just give them the tools”. But with Venezuela was different, as Popovic explains: “In this case, due to the completely disaster that took place, and the suspicion between the opposition groups and the disorganization, we had to start from zero. If they (activists) are going to proceed in the next steps, depends exclusively on them, in other words, if they acknowledge that the lack of UNITY can make them lose the election even before it starts”. >Crime and lack of safety: “The situation gets worse dramatically since 2006. Motivation for a change”. >Youth: “The message must be directed to the youth in general, not only to university students”. >Economy: “Venezuela’s oil is not property of the government, it’s people’s property, it’s your money, it’s your right! Welfare state programs”. >Women: “What do mothers want? Law control? Police acting under local authorities? We will settle the needs for that. We don’t want thugs anymore”. >Transportation: “Workers need to arrive in their jobs. The money is yours. We must request the accountability, and the way it is, we cannot do it”. >Government: “Wealth redistribution, everyone must have an opportunity”. At the end, Popovic finishes his email with a harsh criticism about the Venezuelans he articulates: “Moreover, there is no such a thing as a safety culture in Venezuela. They are retarded … It’s completely a joke!” Pública reported. Searched by Pública, the Canvas leader denied that the organization elaborates custom action plans for revolutions. And he was far less enthusiastic than his “guide” designated to Venezuela. “We teach people on how to analyze and understand non-violent conflicts – and during the learning process, we demand that students and participants use the tools we provide in the course. We also learn from them! Then we combine their realized work with public information to create case studies. And that is transformed in a longer analysis by two interns. We use these researches and share it with other students, activists, researchers, professors, organizations and journalists who we cooperate with – that are interested in understand the people power phenomena”. A former colleague of the student movement, Ivan Marovic – who gives lectures on how the revolt in Serbia has dethroned Milosevic nowadays, and who has no connections with Canvas – agrees with him: “It’s impossible to export a Revolution. I always say in my lectures that the most important thing in order to a well-succeeded social change is to have the majority at your side. If the president has the majority at his side, nothing will happen”. However, Marovic evaluates that a change had occurred in the way western governments sees “NGOs affiliates”, especially in the US, after the Serbian revolution in 2000, and the “colored revolutions” that had followed in Eastern Europe. “One month after we overthrew Milosevic, the New York Times published an article where it says that who really overthrew Milosevic was the US funding support. They’re increasing their role. And now they do believe that US money can overthrow governments. They tried the same in Belarus, sending a large amount of money to NGOs, but it didn’t work”. Researcher Mark Weisbrot partially agrees with Marovic. No foreign group, even more a small one, can cause a revolution in a country for sure. For him, it’s not the north-american government money that makes the difference – NGOs funded via the NSC, USAID or the Department of State. “The Venezuelan elite don’t need any money. What these US financed groups (from past to date) aggregates are two things: 1) the ability and knowledge to subvert regimes; 2) and this support has a unifying role. Opposition can be divided and they can make it unify”. .. and then it is the DNC that blames Russia interfering in the election they lost!? This cannot be true, can it?